My childhood was full of insecurity and self-doubt, the result of years of harassment, taunts, and jokes about the ball/rag/tomato/towel/etc. on my head as a turban-wearing child. My insecurities, however, began to shift (or expand) as puberty hit. Let’s call it facial hair anxiety. At first, having a moustache grow in at a young age wasn’t necessarily a bad thing. After all, I passed as much older than I was, which was nice for a scrawny brown kid like me. But soon enough, the complex around my dhari (beard) settled in, and no amount of time with a thatha tied tightly around my head was ever enough to totally alleviate my beard insecurities. CLEAN-shaven. The implication being that facial hair is….dirty? These are the messages we get from our peers and from the media every day. So naturally I assumed it was highly unlikely that any of my female classmates would ever be interested in dating someone like me. The combination of a dirty face plus a patka was enough to cause a whole lot of anxiety and insecurity for this angsty teenage Singh. Angstyness aside, I spent a lot of tim e grooming my beard. Applying a liberal dose of gel (Dep #11 was my product of choice) to my beard and smushing it to my face with a thatha for as much time as I had (facilitated and sped up with the power of a blow dryer) was a daily ritual for me as soon as I had enough hair on my face to do it. I was never into the beard glued to the face look, but I did like it smooth. There were always the “bad beard days” when a rebellious group of hairs would inexplicably pop out of place into a conspicuous tight curl on my otherwise smooth and sleek dhari. Or the hot and humid days when no matter how much gel I put on my beard, it would just revert to a frizzy, curly mess within an hour. The obsession of keeping my beard looking a certain way grew proportionally to the length of my beard itself. Bobby pins soon came into the mix, all adding to the complexity and time of the morning dhari routine. My dad and older brother had similar routines with their beards (my dad keeping it old school with the fixo, of course), as did all my Sikh male friends who kept their hair and beards and unshorn (with different levels of obsession). We’d exchange tips on the most recent holding products and techniques we were trying. It was actually a fun way to connect with other guys in the community, always proving to be a good icebreaker to get a conversation going. Beard-tying was simply the status quo for the majority of my hair-faced life. I never questioned it. It’s just how it was. It’s just what we did. When I look back on it now, I see a direct connection to my aforementioned facial hair anxiety. My borderline obsessive desire to keep every hair on my face a certain way was perhaps (at least partly) rooted in my anxiety around my beard (and turban) not being attractive. Perhaps it was a way to try to fit in just a little bit more. Fast forward to my late twenties when I was attending the Sikh Research Institute’s fabulous Sidak program in San Antonio, Texas. 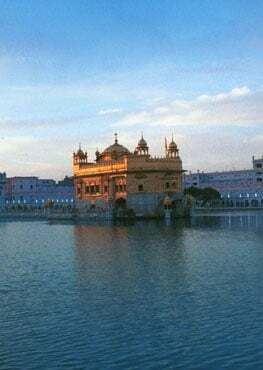 It was an intensive week of interpreting Gurbani, discussing the Sikh revolution, building sangat, and of course, waking up really early for morning prayers and such. My second morning there I woke up too late to deal with my dhari so I went to the diwan hall all natural. The facial hair anxiety was creeping up even in that all-Sikh context, but I went with it at least for the morning. Later that afternoon I finally had time to gel, tie, and thatha my beard. Much to my surprise, a handful of members of my new sangat asked me why I tied my beard back up, saying it looked nice open. I thought and thought and thought about it, but really didn’t have a good answer. I shrugged my shoulders and went on about the day, but the question continued to irk me. Why was I tying my beard? I couldn’t come up with an answer that I was comfortable with, so I didn’t gel or tie it for the rest of my two weeks there—a totally unprecedented move (up until that time I seldom left the house without tying my beard). After coming back home to Brooklyn, I thought about why I chose to keep my kesh and wear a turban and about how proud I am to be a Sikh and literally wear that identity every day. I thought about the boldness of Guru Gobind Singh instructing the members of the Khalsa to wear dastars to mark themselves publicly as revolutionaries, rather than to blend into society. I thought about all the years I spent obsessing over trying to make my beard look a certain way without ever questioning why it was that I was doing that. So began my path from facial hair anxiety to beard liberation. It took awhile to get used to and appreciate the new khuli dhari look, especially since my beard is relatively long. While insecurities about my beard still creep up from time to time, overall I think about how my beard looks so much less and pretty much never obsess about it any more. Ultimately, this has been a transition towards self-acceptance. And as a bonus, I never have a crunchy or flaky face from holding products any more and save a whole lot of time getting ready in the morning. I imagine this sounds familiar not only to other Sikh men who wear their dharis open but also to Black women who wear their hair natural. Last year I was at a gathering at my aunt’s house and was taken aback when multiple (Sikh) friends of my aunt’s (who I did not know) practically interrogated me about my beard throughout the evening. They seemed almost threatened by my choice to leave my beard open. One older uncle asked me, “Who told you to do this?” and “What are you trying to prove?” The question came up time and time again in different ways that evening and continues to when I interact with certain (more affluent) segments of our community: Why in the world do you not tie your beard up? But shouldn’t we first ask: Why DO you tie your beard? I haven’t done any substantial research on the topic, but I have heard from a few mentors and friends (who know way more about Sikh history than I do) that beard-tying became a common practice after the British colonized India and recruited Sikhs to serve in the Army. Perhaps then beard liberation takes on a whole new meaning of decolonizing my body. Of course there are many reasons the Sikh men tie and/or put holding products their beards, and I am certain that for many, the decision to tie and/or gel their beards has little to do with insecurity or self-doubt. My point here is not to prescribe what Sikh men should or shouldn’t do with their beards, but only to convey my own story and experience and why I’ve made the choices I make. I also hope we can engage in more dialogue about why we make the aesthetic choices we make with respect to our hair/beards, and the pressure, judgment, and intracommunity policing that surround these choices. This is a conversation much bigger than the Sikh community, but perhaps we can start here, with our dharis.